Train number 35 known as the International Express, is a daily overnight service from Bangkok Thailand to Butterworth in Penang state, Malaysia. If you want the easiest way to travel from Bangkok to Penang island, then the train is much more convenient and relaxing compared to travelling by bus, as there is no direct service from Bangkok. If you did want to travel by bus, you would have to first catch a bus to Hat Yai and then catch a minibus from there to Penang. You could of course fly - Air Asia has a fairly cheap flight direct to Penang from Thailand's capital, but unless you book really early to get the really cheap deals, the train will work out cheaper. Thai Airways also has direct flights but they are 3-4 times more expensive than the train. ****Please Note : This service will now be terminating at the border station of Padang Besar. To get from Padang Besar to Butterworth, there are now regular KTM Komuter Train Services stopping at all stations on route to Butterworth. The International Express is now operating as Train number 45 from Bangkok to Padang Besar. This train departs Bangkok at 15.10 and arrives in Padang Besar the next morning at 08.53 (09.53 Malaysian time), with a change of train at Hat Yai (as only one carriage travels to the border). A Komuter train from Padang Besar to Butterworth costs 11.40 MYR (bring some Malaysian money with you as you will have to pay in Ringgit and the moneychanger at the station is currently closed down). 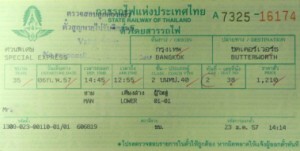 If you are told the train is full on the day you want to travel, try asking for a ticket just to Hat Yai as there are many more coaches on this sector of the journey (Or you could travel on one of the other slightly cheaper trains from Bangkok to Hat Yai and then take a Shuttle Train to the border). If there are berths to Hat Yai, you can then buy a seat from Hat Yai to Padang Besar, as tickets are sold as seat only from Hat Yai onwards, so the 40 beds turn into 80 seats. Another option would be to catch a minibus from just in front of the the Hat Yai station to Penang for about 400 Baht. The first minibus leaves around 9am. 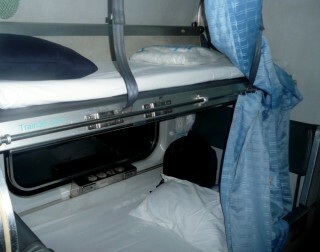 Second Class Air-conditioned seats on Train number 35 from Bangkok to Butterworth are turned into beds in the evening. 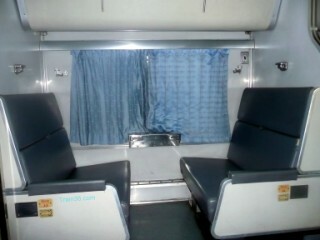 Photo showing the sleeping berths - The lower berth is much wider and more comfortable than the upper berth. Try to avoid seats 1-4 or 37-40 as these are at either end of the carriage and next to the automatic doors (37-40) and toilets (1-4). If you book late, these will probably be the only ones still available! You can buy your tickets from Hua Lamphong station (pictured above) or any other train station in Thailand up to sixty days in advance. During the high season (December - March) it is advisable to book this train at least a week in advance if you can, especially if you want a lower berth. Or from any ticketing agent in Bangkok, but they will charge an extra fee and it is quite easy to go to the station yourself and visit the nearby Chinatown at the same time. There is a restaurant car on this service, which you can either visit for your dinner or breakfast or have delivered to your seat. One of the Thai Railways staff will come around with a menu in English for you to choose from and order your dinner and breakfast. Dinner is served just after 6pm and breakfast around 6am just before arriving in Hat Yai where all but two of the train carriages are taken off. You can also purchase soft drinks and coffee (beer is now off the menu due to an alcohol ban on Thai trains). Many passengers bring along their own food or pick up food as the train journeys south from vendors at the stations. In Hat Yai where the train deposits most of its coaches, food vendors will get on the train selling fried chicken and sticky rice and some fruit. If you don't fancy that for breakfast you can wait until you get to Padang Besar station on the border where there is a cafe upstairs and if you get through immigration quickly, you may have time to have some Malaysian breakfast and a nice cup of coffee. Once you arrive at the border (Padang Besar), you will have to go through passport control. If you have an overstay visa fine to pay go straight to the offices behind the booths. Just ask one of the Thai immigration officers where to go. The queue can sometimes take an hour to clear if the train is really busy, so if you want to go and have breakfast upstairs at the cafe, you should try to be one of the first in the queue. Just after being stamped into Malaysia there is a customs baggage check. If you want to change some money there is a money-changers booth at the southern end of the station. He gives a fairly decent rate, but only change up what you need here as you will get a better rate where there is more competition (the money-changer now appears to have closed down). 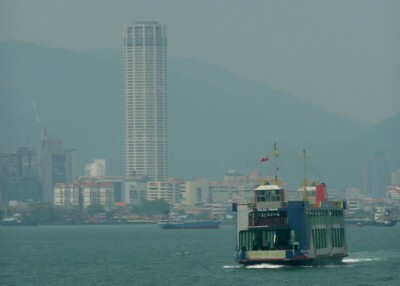 Ferry from Butterworth to George Town on Penang Island. If your final destination is Penang island, the ferry terminal is just a couple of minutes walk straight ahead of you when you exit the station. Ferries leave every 15 minutes or so and take another 15 minutes to get to the jetty in Georgetown. 1) Walk into town - Chulia Street starts just to your left when you come out onto the main road and it takes only 5 - 10 minutes to get to the main backpacker area along Chulia Street where the road meets Love Lane which then leads onto Muntri Street. All good areas to search for budget accommodation. It takes a 10 -15 minutes to walk to the more upmarket area of Penang Road. The bus station at the Jetty in George Town. 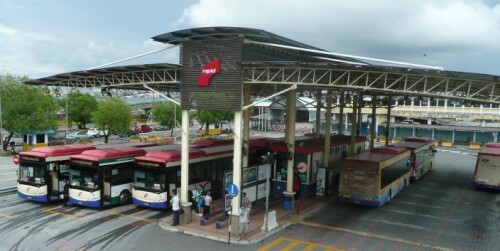 2) Catch a bus : the RapidPenang bus station is right next to the exit from the ferry terminal. Buses from here go to everywhere on the island. The most useful bus is the 101 which goes every 10 minutes or so and travels along Chulia Street, to Penang Road, KOMTAR, Burma Road, past Gurney Drive then out to the beaches at Tanjong Bungah and Batu Ferringhi. There is also a free city bus that goes from the left side of the bus station. This free service passes close to the cheap accommodation area in Love Lane (near the Museum bus stop), Penang Road and onto KOMTAR. 3) Take a taxi - Taxi drivers group around the jetty waiting for the tourists coming off the boat. Taxi's in Penang are supposed to use their metres, but unfortunately nearly all don't, so you will have to bargain with them which is quite difficult if you don't know what the price should be. Their minimum fare is 10 MYR which should be enough to get you to Chulia St.
Our advice, use the bus! If you are not planning on staying in Penang and want to continue travelling south, the busy Butterworth bus station is now located just in front of the railway station. Buses from here operate regular services to all places in Peninsular Malaysia throughout the day. 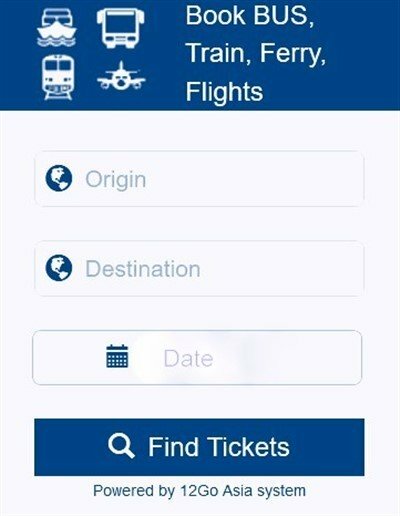 So it is easy to make train / bus connections to destinations like Kuala Lumpur, Ipoh, Cameron Highlands, JB and Singapore.